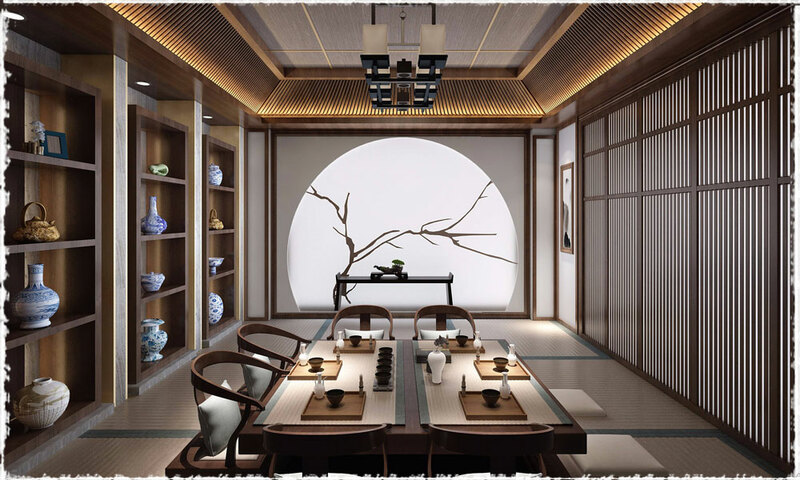 Many friends know a lot about western afternoon tea etiquette, yet, few of them are acquainted with China’s. Here, TeaVivre would like to lead you into the world of the traditional Chinese tea etiquette. As is well-known, China is a country with a time-honored civilization and a land of ceremony and decorum. 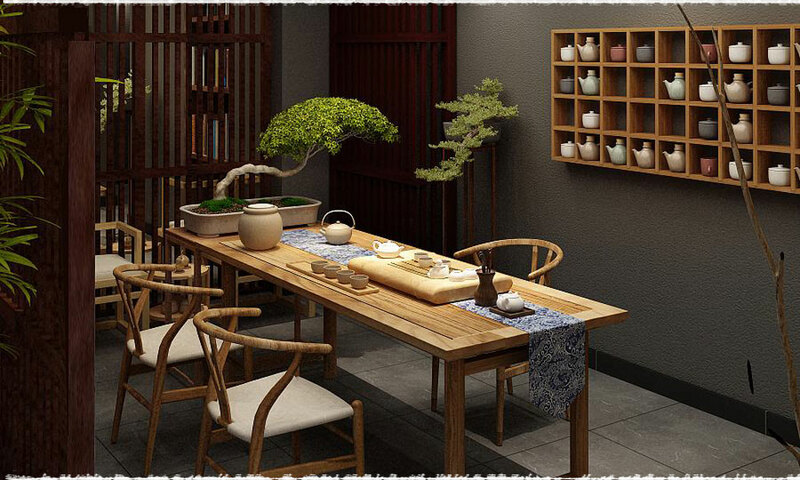 In China, tea is always served when guests come to visit. As an important medium of etiquette, tea plays a significant role in Chinese interpersonal relationships. Knowing the tea etiquette, being polite and showing respect when drinking tea in Chinese teahouse can not only reflect your good self-cultivation, but also bring you the pleasantness and peacefulness from tea. 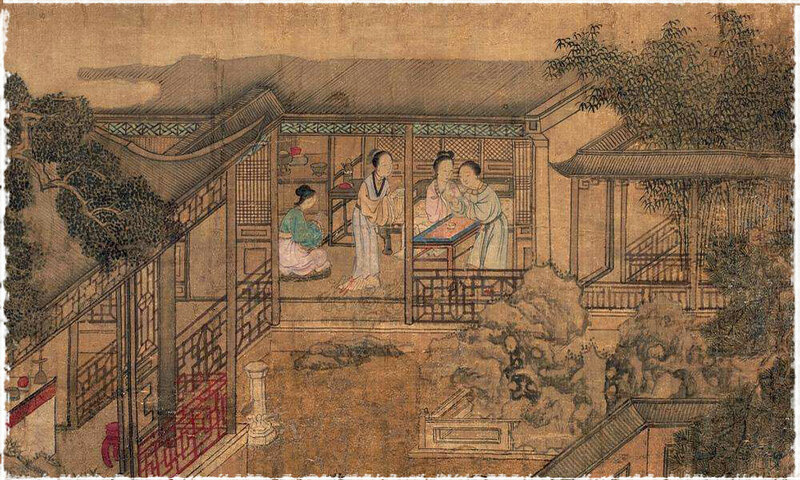 Nowadays, few people know the seating etiquette in traditional Chinese teahouse. Conventionally, the host’s left hand side should be the first guest of honor, the importance of the seats are in descending order from the host’s left hand to the right. It is the iron law to follow regardless of the table shapes. Besides, the old and teachers are most revered to take the first ranked seat, among them ladies have the priority when age differences are small. In addition, it would be inappropriate to sit opposite to the host. If it is inevitable, children should be allowed to take this seat. 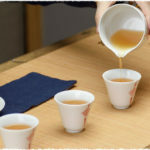 It is the first time that the guests express appreciation to the host when they’re invited to taste the first steep, it is one of the most important etiquette in traditional tea ceremony. 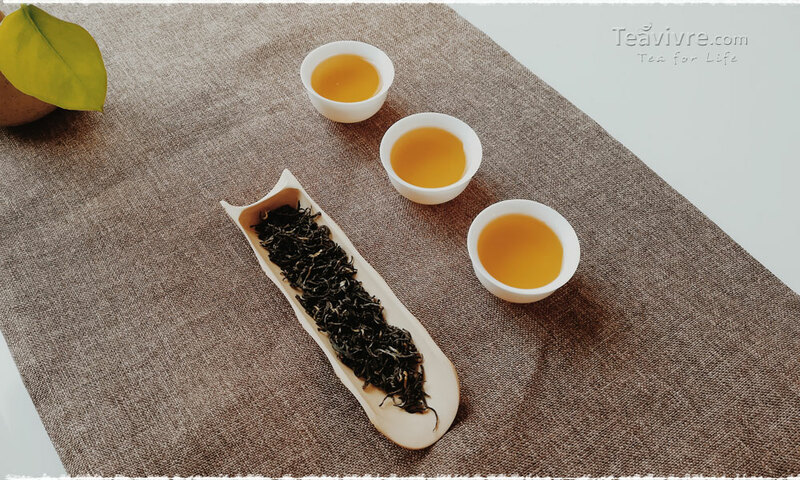 The formal and standard gesture is to stand up, men hold fists(left over right), women put palms together, make a bow, sit down, and take over the tea cups, smell the tea’s aroma first, then take a sip and savor the tea. Finger Kowtow, otherwise known as finger tapping, is a ritual performed as a silent gratitude to the person serving the tea. 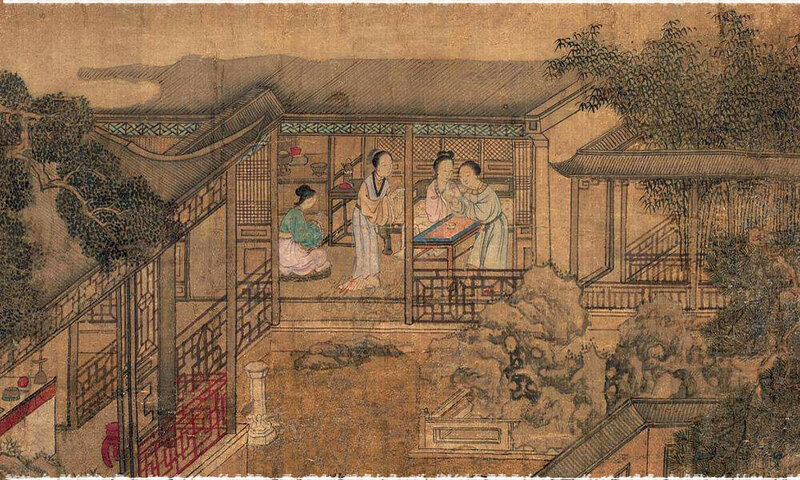 According to legend, Emperor Qianlong of Qing Dynasty used to travel incognito to the south and once he went into a teahouse with his companions. The tea house owner used a long pot and poured the water three ups and downs with rhythm to make a cup of tea without even spilling a drop. Emperor Qianlong was impressed yet didn’t understand, “What was that movement?”, he asked. The owner smiled and said: “ This is the tradition of our tea house called ‘ Three Nods of the Phoenix’”. Heard that, Emperor Qianlong took over the long pot and tried to do the same, but that cup was his servant’s, normally the servant would get down on knees and kowtow to the emperor for this great honor. However, to do so would reveal the identity of the emperor, so the quick-thinking servant bent his two fingers and tapped on the table as if his was kneeing and kowtowing to the emperor. From then on, finger kowtow has been the practice. 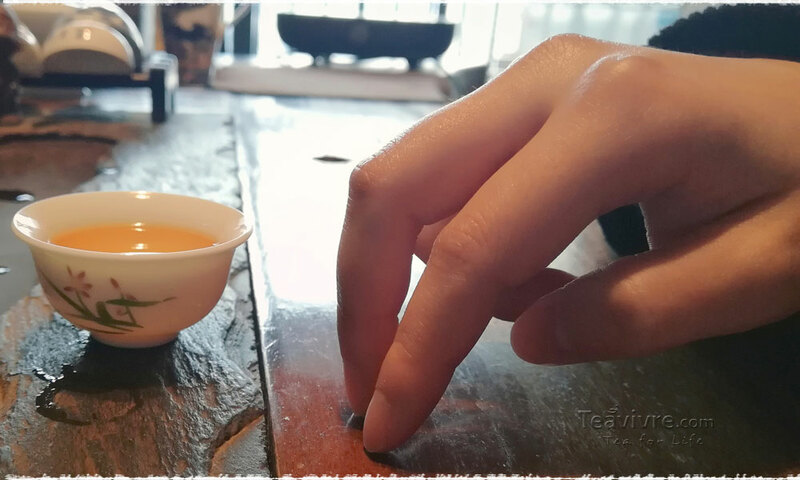 Nowadays, instead of the implication of kowtow, people just tap their two fingers on the table to pay silent thanks to the tea server. 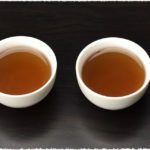 Tea is not plain water, it can nourish your palate and mind. If you’re not thirsty, then do not drink up the tea at once. On the contrary, you should take a sip and savor the flavor, from astringency to sweetness till the long aftertaste, you may find words are too plain to describe this fascinating process. It is considered that the biggest impoliteness of the guest is to spit the tea out of mouth, especially, in front of the tea server. This bad manners may also imply the provocation to the host. Smoking cigarettes during the tea drinking is disrespectful. If you are a heavy smoker, you should ask the host for opinions after several steeps. Keep calm and relaxed when drinking tea, instead of being absent-minded and dispirited. Tea is not only a delicate beverage, it can also be your bosom friend. When you feel uneasy, it helps you calm down; when you feel distracted, it makes you relax; while when you find your inner peace, it will dance on your palate and bring you indescribable flavor. What a wonderful friend! 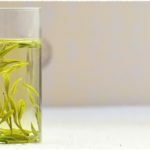 NextNext post:How to choose the right tea for yourself?